Just as there are many steps in the manufacturing process, there many opportunities for inspections during the process. Which specific inspections you need depends on the nature of your product and your level of risk tolerance. The figure below shows the flow of inspections and how they are related to one another. Note that the Bar Code Inspection and Standards testing can be done either during of after production. 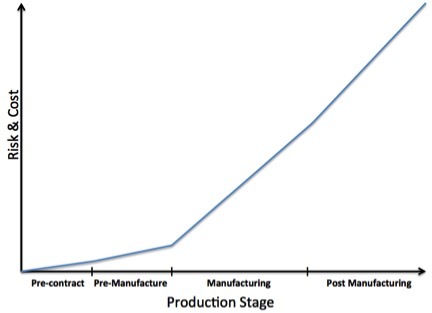 As a general rule, the later in the production process an inspection is done, the higher the risk of delay and cost because a higher volume of product has to be re-manufactured. The table below lists the various risks, their associated costs and the inspection(s) that can prevent it. · we can lower risk but doing the proper inspections at the correct time. When a company skips the earlier inspections and uses the Final Random Inspection as its only quality check, the cost of an error is many times more than the cost of the earlier inspections would have been. While this strategy may work for a factory one has been dealing with for some time, making the same product, it really is not advisable when working with a new supplier or on a new product with an existing supplier.